An international training course aimed at promoting the intercultural dialogue through the teaching of religion in high schools was held in Venice, from 13 to 17 March 2017. 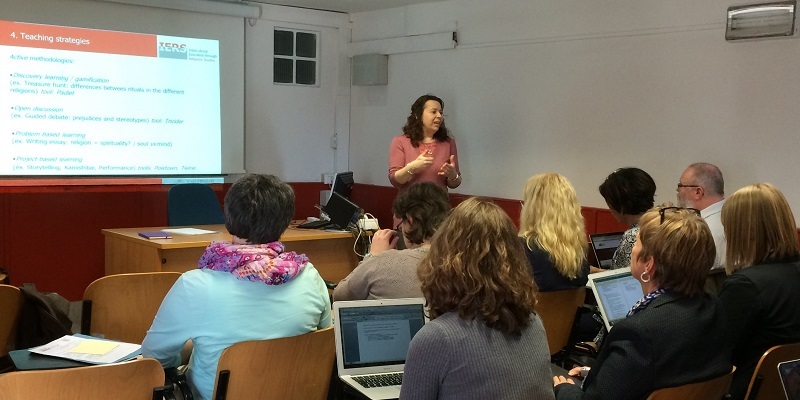 In the setup of said course, the experience gathered during the implementation of the IERS – Intercultural Education Through Religious Studies https://iers.unive.it/ project proved significantly crucial to ensure the remarkable participation of 17 teachers from all over Europe in the training activities. A wide range of theoretical and practical issues were covered, ranging from all the diverse approaches to learning religion to the different methods to use ICT in class. All the participants expressed their satisfaction towards the issues addressed and the methodologies used. This peculiar kind of learning process has been designed for the purpose of being replicated in other Member States in the near future. The learning process was an opportunity to present the new SORAPS project, which takes up its partners and objectives from the previous IERS project; the proposed action has been welcomed with great interest by the teachers involved, who expressed their willingness to be active parts of the follow-up project. In the end, we can confidently conclude that these relations, synergies and continuities between different Actions represent a fundamental way of guaranteeing the positive impact of project activities on both beneficiaries and targeted partners. For further information, please refer to the following documents: http://bit.ly/2xRyTR3 and https://iers.unive.it/in-service-traning/.